Silver Snow Peak is the third level of Donkey Kong Jungle Beat and the first area of the Orange Kingdom. It takes place on the base of a snowy mountain. Donkey Kong has to reach the peak of the mountain. He meets his second Jungle Buddy, Hoofer, here and rides him through the entire level. Iguanagon tries to stop Donkey Kong and Hoofer by chasing after them here as well. For every ten meters traveled in this level, Donkey Kong gains a beat. Unlike the other levels, Donkey Kong does not need to eat the giant fruit at the end of the level, and he only has to touch it to finish. After touching the fruit, he must jump off of a ramp with Hoofer to gain extra beats. At the beginning of the level, Donkey Kong is on Hoofer, and the two ride through ice to progress and collect bananas. Near here is a platform with a few icicles hanging under it. If the two characters choose to go under the platform, Donkey Kong gains a few beats. However, if he uses the platforms to lift him up to a higher platform, he can run into many more beats. The is a small fork in the road farther on, and Donkey Kong can either ride on the long platforms ahead, or simply head under them. Taking the top route leads him to more bananas, while the bottom takes him to a few less bananas and a small enemy blocking the path. After passing through three Banana Bunches, Donkey Kong, still riding Hoofer, travels down a steep hill. While heading down however, they are chased by a giant snowball. Collecting Blooms all the way down the hill, the snowball soon stops, and the group travels up a steep hill. There is a tunnel nearby that they enter on this hill. Inside, there are some Snow Moles sticking through the bottom and top of the tunnel. They must be dodged for Donkey Kong and Hoofer to progress. After crashing into more bananas trapped in ice, Hoofer and Donkey Kong come up to even larger Snow Moles sticking out of the sides of the area. There are some bananas around this area as well, although they are all still encased in ice. Eventually, Donkey Kong and Hoofer meet the exit of the tunnel and head down another large hill. 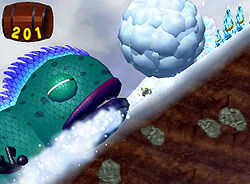 At the bottom of the hill is another giant snowball, which Donkey Kong can destroy if the player claps their hands. At this point, Iguanagon begins to chase the group. After treading up and down hills and crashing through bananas encased in ice, the animals make it into a tunnel, which Iguanagon is too large to enter. Inside the tunnel, there are a few bananas to collect, some being encased in icicles. Once Donkey Kong exits this tunnel, he and his Jungle Buddy come up to the large orange. Touching makes the level end, however, right after, Donkey Kong plays a bonus on Hoofer, where he must jump off a ramp to receive more beats. The amount gained is equal to the distance jumped. Hakugin no Taisetsuzan Great Silvery Snow Mountain; 「白銀」 hakugin can mean "snow" or "silver", while 「大雪山」 taisetsuzan means "great snowy mountains" and may be a reference to an actual mountain range in Japan.